A signature is a handwritten proof that depicts one’s identity. A known fact, isn’t it? But here the focus is on online signature. The popularity of electronic and online signatures has increased considerably with the increase in the usage of e-mails and other online mediums of communication. These include online agreements, Business transactions and contracts. Surely this number is set to grow bigger than ever. These deals include a extensive use of signatures to approve and sanction the purpose at hand. Signing papers using pens and converting it into a electronic format might involve spending of time and money. This is where Online Signature comes into the frame. Important documents can now be legalized and made permissible through online signatures which are small and even attention grabbing. To help you create your own Digital online signature, we have compiled a list of the 6 Best Online signature tools. SignNow is one such free Online Signature tool which allows you to sign papers and documents online with ease. One of my personal favourites as well considering the fact that it is really easy to use and has got a user-friendly interface. Of late, they have also launched the mobile app for their product using which digital signatures can be done using your cell phones on the go. MyLiveSignature, another free and fun service that is a free web app that allows you to create cool-looking signature using their in-built fonts and gives you the option of mailing it or use it on your blog articles. You get to choose from the 10 various styles that have been generated once you enter the signature text. Their team will help you create your own hand written signature as well for a low cost. Mobilefish, a website that consists of 40 various tools including the signature tool allows you to create digital signatures along with some animation effect too. You get to choose the option of creating an animated signature by setting the Animation speeds, loops and angles. Not the suitable one for professionals, but really worth a look. More or less similar to that of My Signature Live, My Free Signature Maker also allows you to create 10 signatures at a time. 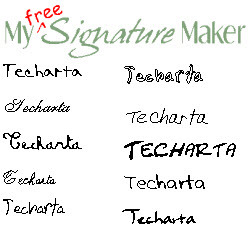 All the signatures generated consists of freeware fonts which can be embedded in your email signatures or MS office files. Online Signature Pad comes with customizable features including Background Color, Background Image, Pen stroke size and other similar ones. 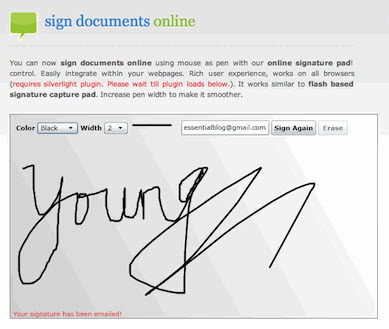 It also allows you to sign using mouse as pen on their online signature pad. They also offer paid services. e-Sign Live, although new, is very professional online signature solution. They offer electronic signature solutions at a very affordable price before which you can try out their 30 day free trial. e-Sign Live helps you to sign documents in orderly manner when you got heaps of them. For the additional security, they even provide advanced level of authentication. It also supports templates for the documents that requires your signature at a regular interval of time. It comes with a 256-bit SSL encryption which makes your data secure than ever. They also offer business solutions in the various business fields along with case study which comes in handy for the newbies. e-Sign Live is the e-Sign technology that is trusted even by US Army. 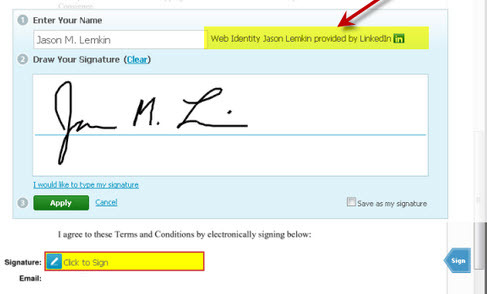 Echosign by Adobe is a professional online signature application which comes packed with lots of features. It keeps track of the papers and documents that you signed and mailed. A very secure service, Echosign also offers premium and paid eSignature solutions. You could opt for a paid package on monthly basis which comes bundled with loads of features. If you are looking for ultra-professional service, echosign is the one for you. 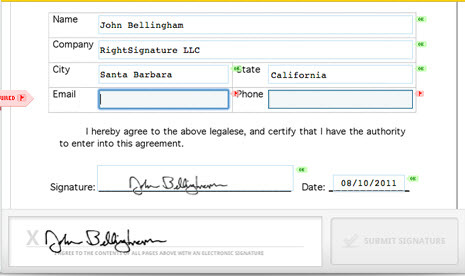 RightSignature, another safe All-in-One E-Sign Solution is another competitor among it’s class. The features they offer include logo branding, creation of online forms, digital fingerprints and Blackberry mobile signing. They also offers free 30 day trial offer before the customer opts to choose from their cheap plans. Used by over 25 million people in over 188 countries worldwide, Docusign sets the global business standard. One of the few Online Signature providing solutions that use Cloud technology to store your documents securely in the cloud that enables you to access your document from anywhere and any device whenever required. They have a good community support as well for their customers. Like most professionals, Docusign too offers 30 day trial. Explore their site to know more about them. Hi Nikhil, Great list of signature maker tools bro. Not even heard a single tool before and i will surely try out the tools which you have listed above. Thanks for Sharing!